The brightest star in the constellation of Ursa Minor sure aligned with Reward Flying today. UA838 from Narita was due in at 10:40am. The next flight to Chicago was at 11:40am on a 777-2 but it's not a valid connection. The first valid was not until 1:28pm on an ancient 757-300. I wasn't cherishing the thought of a 3 hour layover in San Fran then that. Previously I had checked to see how many business class seats were available on the 11:40 in case of an earlier arrival. None. UA838 wheels touched SFO's 28R 45 minutes early. AT&T received my login signal immediately. I opened the UA app and searched flight status for SFO-ORD then selected the 11:40 flight and clicked on the seat map. IT'S THE SEAT MAP OF THE 777-300!!!!!! AND THERE ARE SOME OPEN SEATS! The domestic 777-200 has 28 business/first class seats, the 777-300 has 60! So I called United and got an agent who said there were no saver award seats available on this flight. You're no help. I hustled to the United Arrivals lounge. "Good Morning, Is there any availability on flight 794 to Chicago in business class this morning", handing her my 698 boarding pass. The attending agent was super friendly. "What seat would you like?" "15A if you have it?" "Would you like to take a shower while I make the flight change and print your boarding pass?" "Yes please." The dreaded 757-300 horrible first class experience was now a new 777-300 Polaris business class experience. And this plane was even newer than the brand new Tokyo aircraft, a week into the fleet on what was probably it's 10th revenue flight. Polaris shines! I profusely thanked the Arrival's lounge attendant and headed to Gate 89 stopping only to waste $5 on a bottle of water. Ugh. This was Group 1. Didn't matter. My fortunes on this day couldn't be dampened. 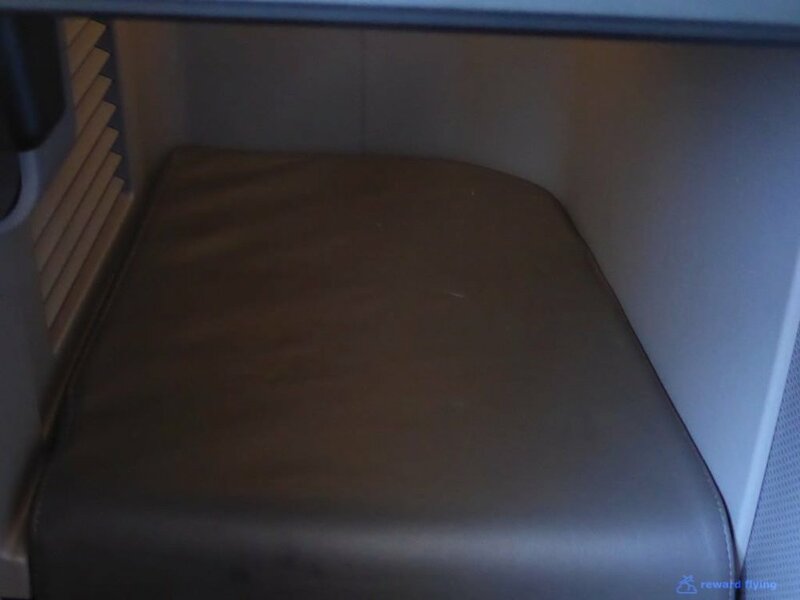 In this report I will try not to be repetitive with regard to features of the Polaris business cabin. However the lighting was much better as the window shades weren't drawn such as they were in Tokyo. Entry through door two. I was able to get some photos of the front cabin this time. Very pleasant cabin mood-lighting mid-flight. The ceiling above a lavatory entrance and self-serve galley. Center bulkhead walls in both cabins. Mesh curtains separate the cabins. 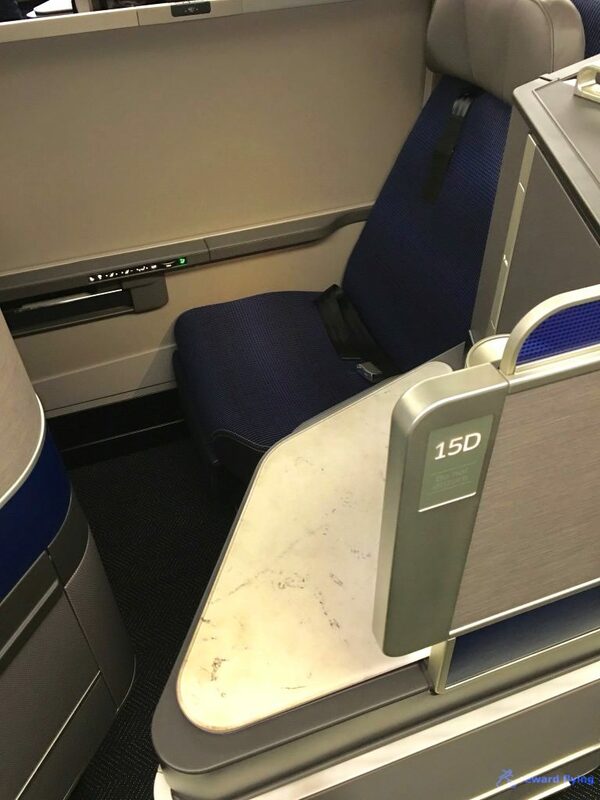 The missing window for row 16 seat A. All other seats that angle to aisle have reduced privacy. The center angled seats appear to have a smaller side table and it's certainly not as easy to reach as it's partially behind your shoulder as you sit, as is the light switch. There have been comments about the lack of legroom. Listed legroom when lying flat is 75 inches. However when sitting in an odd row window seat, crossing your legs may not be so comfortable. The mystery of the button below the light switch. What is it? I asked the FA and he didn't know. He said that United doesn't train them on the features of the seat and a co-worker was wondering what the button did was as well. I looked for a placard that might explain the seat. Ahhh, you're in the age of technology, remember? 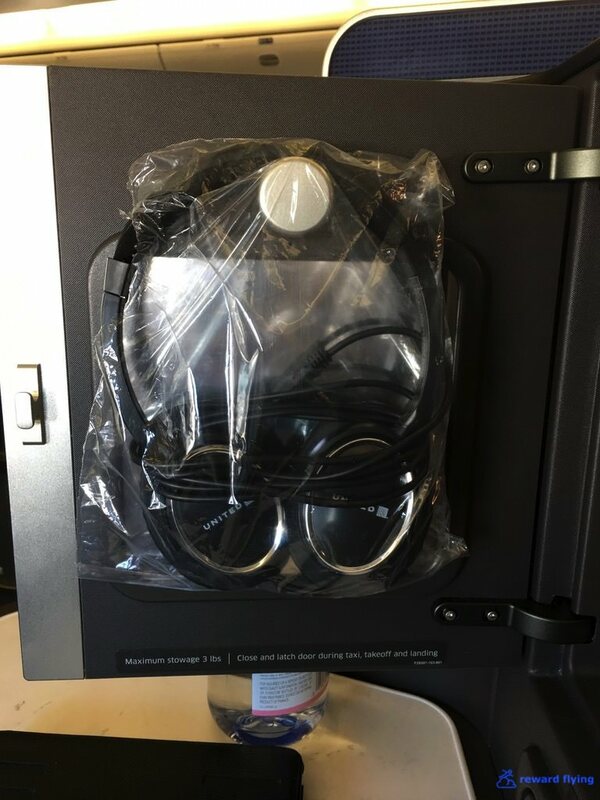 The IFE System has a complete instruction guide. I learned that little button controls the brightness of the light. Time to go. We departed 80 minutes behind schedule, not that I cared as I was still ahead of the game. In the descent towards ORD we went into a hold. The captain announced there was an ATC issue at the airport. The hold lasted for 5 minutes. Later on when I checked the flight status on United's app, the reason given for the delay was listed as "ATC delay". I'm sorry, we left 80 minutes late and the ATC delay was 5 minutes. The reason for being late is SFO ground had no idea on how to board the aircraft. Little towel plates are so much nicer. Today's amenities. I suspect there was a pillow around somewhere. Of course there were no menus. It might have been good. It might have just been hunger. Whichever, it was consumed. False advertising. I never saw a dessert cart on any flight. 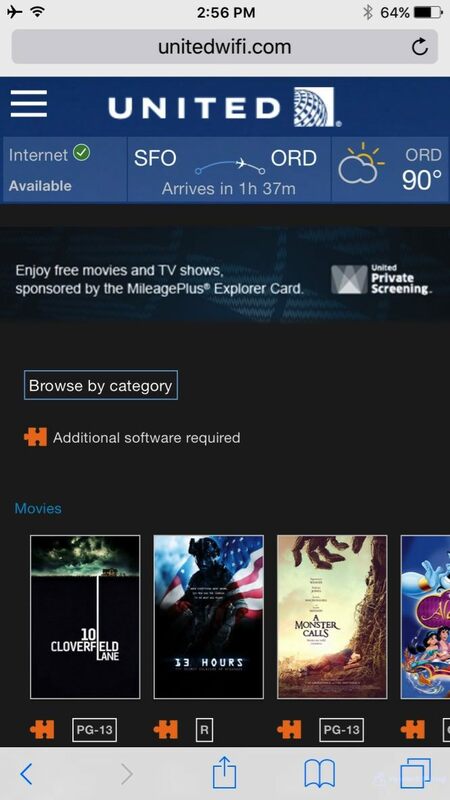 Wi-Fi was available and you can stream movies with United's app. The tray has a cutout to hold your tablet upright for viewing. 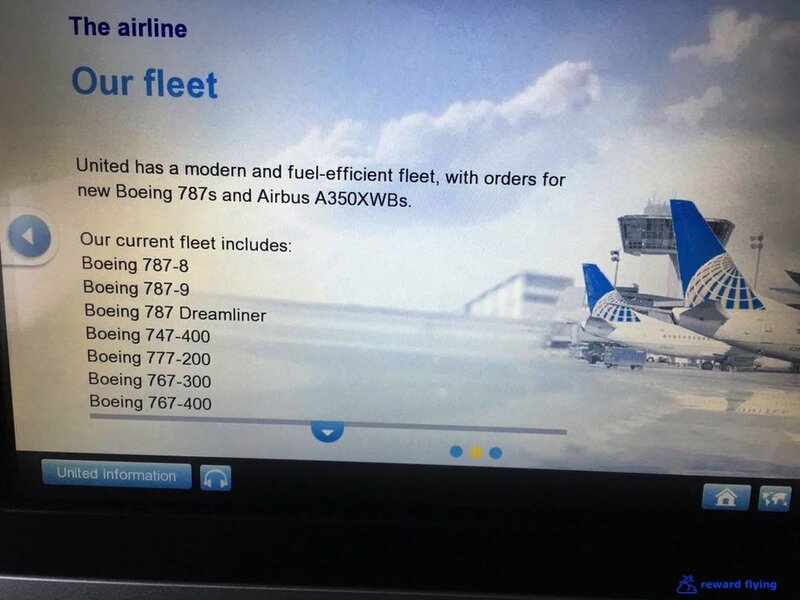 Clicking around the IFE system I found information on United's fleet. Something missing? The IFE system had airport specific arrival information. Unfortunately for me the Captain chose not to have Channel 9 available on this flight. It was a beautiful day for flying, especially on a brand new aircraft. You can tell as it's sparkling clean. Parallel approach, racing AA737. My engines are bigger, he won. Wrigley Field again. ✔︎Stunning 777 business class cabin, but a few too many seats in my opinion. ✔︎These are great seats, yes some flaws but night and day improvement over both current UA J offerings. ✔︎Typical tray bound one serving. ✔︎The meal was okay, or I was just hungry. ✔︎This was a good crew. They were learning the aircraft as well. It was their first time too! ✔︎B777-300. I remember being on the first revenue flight of 777-2 UA204 back in 1999 I think. Brand new beautiful aircraft. I wouldn't be so excited to fly it today. Today's flight path. Notice the hold, a good reason for being an hour late don't you think? While waiting for departure I snapped a few familiar aircraft. 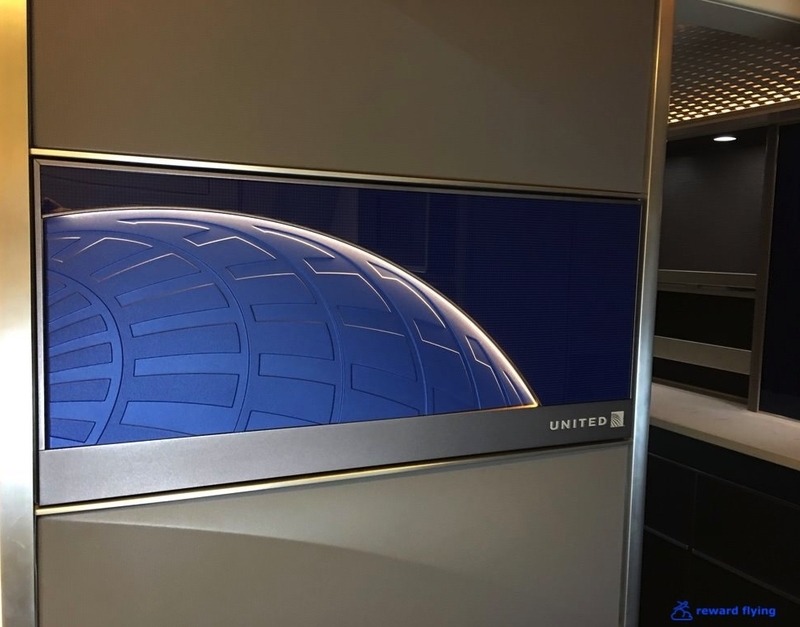 Flying United's new 777-300 back to back was truly a treat. While the aircraft is stunning, what new aircraft isn't? The seats are very good, the same as ANA's business class seats and those are quite comfortable. I think United squeezed a few too many in the cabin however. Still it was private unlike the cattle call on Swiss' new 777-300. I'm sure as these planes age and the seats become worn I won't be as enamored the way I am now. Forward facing seats on the window and in the center are private and nice. Angled seats on both sides of the aisle lack privacy. You are completely exposed to the aisle. Otherwise with the Polaris bedding for international travel the seat is great. You can get a good sleep and that is the main consideration. If they want sixty seats in a business cabin then they have to staff it. I've flown other airlines that have five attendants for thirty people in a business cabin. On these two flights I took there were two attendants in the back cabin. Assuming one in the galley for prep work, that's three flight attendants for a thirty person cabin. They need more help to serve the customer properly in a premium class environment. On international flights I've generally had great crews. The Tokyo flight was the worst crew I've had in over thirty trips. Since Polaris was introduced in December 2016 I've taken three Polaris flights, two international and one domestic. The food has not improved and frankly isn't very good. It can be done, many airlines do it. For some reason United refuses to join, but claims they have. Additionally beverage selection is low end at best. United is a hometown airlines and I am lifetime elite. Frankly I was hoping for better with Polaris. Tell us about your United experiences. Feel free to leave a comment below.